You all might have heard the word ‘Holi’ at least once in your life. Today we are going to give you a little glimpse of what this festival really is and why is it celebrated. The Origin: Who Celebrate it and Why? This two-day festival is basically a celebration for the start of Spring, though with a religious context. Holi is commemorated, by the Hindu community in India and Nepal or countries with Hindu populations. Just like Thanksgiving, it also focuses on family reunions and restoring broken relations. However, there is no fixed date for this event, this year, Holi is going to rejoice on 20th and 21st March. For the beginners let us tell you, Holi begin with a bonfire called Holika for people to gather around, sing and dance much like the African style. The next dawn arrives with a rainbow of colors when people chase and throw color on each other with powder, and colored water. This is where the fun part begins as all the young and old equally enjoy. To top it up, a lot of youngsters do it with style carrying water guns and water balloons filled with all shades of colored water. This cute competition of throwing color on each other takes place in open areas like parks, and temples. Since the globalization, Holi has seen many evolutions until now and today it is celebrated around the globe without the discrimination of religion and race. 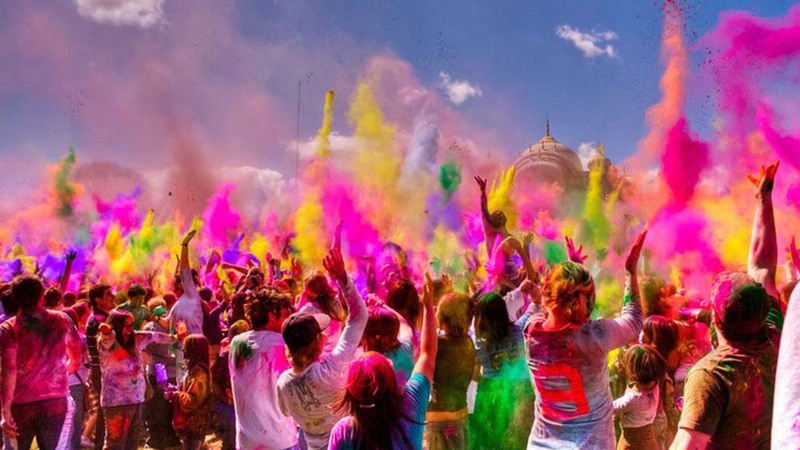 From England and the United States to Spain and Italy, people wait for Holi throughout the year.